Continuing our series of interviews with the prestigious photographers who will be speaking at this year's Infocus photography conference, D-Photo catches up with the uniquely talented Sara Orme. Sara produces beautiful work across a staggering array of styles, from fashion, beauty, and advertising to lifestyle, documentary portraiture, and fine art. Uniting her diverse portfolio is a superb technical mastery and an organic ability to convey emotion that permeates all she produces. You've almost definitely been exposed to images Sara has created in big campaigns for the likes of Tourism New Zealand, Max Fashions, and Campaign for Wool, amongst a long list of other impressive clients. But with a background in both psychology and art history, the photographer is just as at home outside the commercial world, shooting her own self-directed art projects. D-Photo: Can you briefly tell us a little about yourself and your photography? 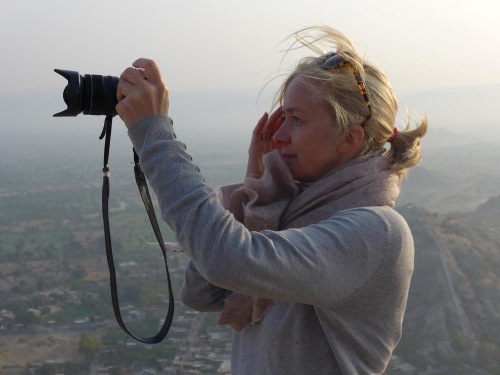 Sara Orme: I am a photographer, wife, and mother, and not in that order! I am a photographer of people. Give me anything to do with people and I am there. How did you get your start in the world of professional photography? Determination, hard work, and doing a lot of work for free. Saying yes to almost anything. My first paid job was photographig apartments. You work in a range of genres– was that diversity a conscious career decision, or just where the path led? I could never decide which one I loved the most and kept dabbling in all of them. Retrospectively, it was probably a subconscious one. Working in a creative industry with likeminded people. Saying 'yes' to jobs when I need them, and saying 'no' to Jobs when I need a break. Solving complex problems, usually late at night and something to do with my computer. I also find it difficulet at times that it is quite a solitary job. What's the most fun you've ever had on a commercial assignment? It is hard to narrow it down to just one job, but travelling out of New Zealand is always pretty fun and even better if we have a forced day off due to bad weather. Most of my jobs are pretty fun. I always try to surround myself with great crew and make sure it is as enjoyable as ever. You do a lot of personal work, do you have a personal project currently on the go? I have two personal projects on at the moment. One is more art-based, shooting nudes, and the other is a polar opposite, working with gang families. In fact, I'm off to do another session straight after this conference. You have a Degree in both Sociology and Art History – would you recommend that sort of academic grounding for aspiring photographers? It has been great refernce for me personally. It gives me a way to approach my work and another layer to my vision. But this isn’t for everyone. If you were to assign homework for attendees before they come to your Infocus talk, what would it be? Think about their own personal life and expereinces and see how that could come into their work. What is something or someone you haven't shot yet but would really like to? There is so much, I actually can’t begin... Just more people, more places, more challenges. Not a lot. A Canon 5D Mark II and three great lenses: 85mm, 24-70mm, and 70-200mm. And a 5x4 large format camera. Travelling, keeping fit, thinking of the next project. The huge amount of budding photographers out there wanting a piece of the action. This is the age that anyone can be an artist. What do you do to get out of a creative funk? Go for a run. Focus on something that is doable and the rest will follow. Who is your all time favourite artist? So many but here I’ll go for the old classic, Caravaggio. He was the first to really explore the great extremes of light and dark and with that comes such an emotive quality.